BANGI, 24 Oct 2013 – Science as a liberal branch of knowledge has improved the lives of humans with better medical care and advanced technologies but have unfortunately also led to the decline of their faith and conscience. Director of the Institute of Islam Hadhari of The National University of Malaysia (UKM), Prof Datuk Dr Mohd Yusof Hj Othman who said this in a lecture here lamented that it has also crippled values and the sense of morality. Speaking at the Tun Seri Lanang Library public lecture here recently, he said it is science and the liberal studies that have caused the steady decline of faith and conscience in the hearts of many around the world. The Tun Seri Lanang (TSL) Library lecture is one of the events organised by the UKM Library in conjunction with Knowledge Cultivation Activities programme. Invited speakers are made ​​up of UKM academics who are distinguished and well-known both at home and abroad. Prof Mohd Yusof said there are three types of people in the world; a person with bad physical health but have a great mind, a person with good physical health but with mental problems and people with sound physical and mental health but have no soul or conscience. He described the third category of people as the worst of the lot because the world’s problems are being magnified by such people who are selfish and heartless. The way the world works now is where children are being raised in an environment that is full of scientific gadgetries and theories that make them questioned their faith and whether God is real. The structure of education in the country is now mostly based on scientific subjects and exams. Subjects that are given the most weight and importance are Science, Mathematics, Chemistry, Biology and Physics not Literature, Islamic or Religious Studies or History. Such unbalanced preference towards science has slowly allowed doubts to creep into the minds of the youths making them slowly yet surely losing faith and their hold on their religion. “Today we see the result of these events. Our young ones are so proud to protest against their religion saying Islam is not right because it does not practice tolerance towards lesbians, gays, bisexuals and transgenders (LGBTs). They want to force our government to make LGBT couplings and marriages legal and halal and more importantly, to be ‘recognised’ as real marriages”. He said there was a time when our culture, traditions and religion kept us apart from the world. Though it made Malaysia different but it was happier and safer. We share, we have big families, we have values and we have faith. The Four main religions in Malaysia Islam, Christianity, Buddhism and Hinduism all promote those values. None of these religions promote individualism, selfishness, unnatural habits or hunger for materialistic objects. “It’s because we all have faith and that is why we are happy. We are happy because we are Muslims, others are happy because they are Christians, Hindus or Buddhists. Because we have something to hold on to, our faith is where we draw strength, courage and positive thoughts. 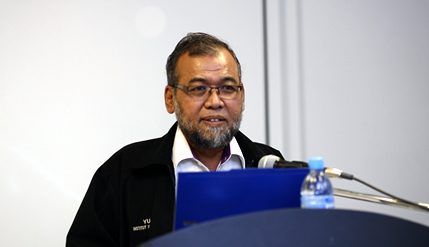 People with science as their way of life do not have that,” Prof Mohd Yusof said. A scientific upbringing may give birth to an intelligent, skilful and capable individual but intellect alone without soul cannot buy wisdom or happiness, he said. Prof Mohd Yusof showed “A Map of Global Happiness” drawn based on an experiment done in the United Kingdom by Adrian White who carried out a survey in 178 countries. He received more than 80,000 respondents and found that 81% of them agreed that happiness or Subjective Well Being (SWB) is more important than materialistic things and wealth. The map showed that the happiest country was Denmark, followed closely by Switzerland and Austria. Malaysia was in the 17th place, the highest of the South East Asian countries placed on the map. New Zealand was at number 18, with America (23), Australia (26) and United Kingdom (41). Of the Asian countries Singapore was placed at 53, Hong Kong (63), Indonesia (64), Taiwan (68), Thailand (76), China (82), Japan (89) and India at 125. Countries that are well established and rich but featured low on the map because they have traded their happiness for wealth and luxuries of life. They have abandoned their religion, traditions, customs, culture and the values and life lessons that go with it. By doing so, they have become individualistic, materialistic and selfish to the point they are willing to let go of all human sense of rights and wrongs to live out their lives saying that countries placed high on the map are also not without faults. Another experiment carried out in 2012 having a closer look found countries placed high on the happiness charts viewed happiness in the ‘solo’ form. To them happiness is complete only if they live a solo life without family or marriage. Most viewed the values of family and marriage as a long forgotten custom that is traditional and pre-historic. “Many do not view marriage a must anymore. Not just in the Western world but even in Malaysia. We have Malay Muslim youths who do not believe in the sanctity of marriage. To them its only just for show, a game,” Prof Mohd Yusof said. Though many of the first world nations have high quality of life, stability, advanced technologies and security but are still plagued by the one thing money cannot buy which their strong governments cannot also deliver and that is happiness.